NOTE: For natural treatment and prevention of high blood pressure (hypertension) use AquaRite together with our High-Rite capsules for complete cardiovascular health! How has AquaRite helped others? Can I use High-Rite and AquaRite together with my prescription medication for high blood pressure? Hypertension is sometimes known as the Silent Killer, because it often has no symptoms at all. Sometimes people with high blood pressure experience headaches or a ringing sound in their ears, but these symptoms may also be due to other causes. The best way to find out whether you have high blood pressure is to visit your doctor, homeopath, naturopath or other health care provider. Although the causes are not always known, high blood pressure can often run in families, indicating a strong genetic component. Risk factors for high blood pressure include smoking, alcohol abuse, obesity, a high salt intake, lack of exercise and stress - and a family history of hypertension and stroke. Arteriosclerosis, or a thickening, hardening and narrowing of the walls of the arteries is also often associated with high blood pressure. Excessive water retention can also be one of the underlying causes of high blood pressure. There are many different prescription drugs for high blood pressure including vasodilators, alpha-blockers, beta-blockers, diuretics, etc. Each has a different way of working and different drugs may work for different people. You may need to try a variety before you find the right drug or combination of drugs suitable for you. Like many synthetic drugs, anti-hypertensive medication has a risk of causing side effects, which depend on the person as well as the type of drug being taken. These can include, dizziness, nausea, stomach problems, fatigue, impotence, insomnia, loss of appetite, low blood pressure and others. Prescription diuretics also have the tendency to leach the body of potassium and to upset the electrolyte balance in the body. Always speak to your doctor if you are having problems. There is a great deal of scientific evidence to suggest that the use of carefully chosen herbal remedies and dietary supplements can help to lower blood pressure, as well as to improve the overall functioning of the heart, arteries and the entire cardio-vascular system. What herbalists and traditional healers have known for centuries has now been clinically proven to be a potentially effective alternative to synthetic blood pressure medication, especially if combined with a healthy diet and regular exercise. High-Rite and AquaRite are two complex herbal remedies which can assist in the treatment and prevention of hypertension or high blood pressure. Like all Feelgood Health products, they are developed with care by our practising Clinical Psychologist, are 100% natural and are manufactured according to the highest pharmaceutical standards. Individual ingredients are well-researched and have been put to the test over the years as a complement to the treatment of real people with real problems. 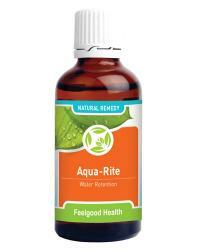 Aqua-Rite is a 100% safe, non-addictive natural herbal remedy formulated by our team of natural health experts. Aqua-Rite has been used for many years to help keep a balance of fluids in the cardiovascular and circulatory systems in the body. Aqua-Rite addresses water balance in the body and healthy circulation as well as blood pressure on veins and capillaries. Aqua-Rite contains a selection of herbs known for their ability to improve circulation and it is formulated as an effective companion remedy for High-Rite, to help keep water balance and blood pressure within the normal range. In supporting water balance naturally, Aqua-Rite also helps the liver and gall bladder to function through healthy circulation. Aqua-Rite can make all the difference, without compromising health and without serious side effects. "I don't know what I would have done without High-Rite to reduce my blood pressure, which runs in the family. I only wish that I had known about it sooner because it really works!" AquaRite comes in concentrated tincture form and is especially formulated as a companion remedy for High-Rite, especially in cases where water retention is associated with high blood pressure. Agathosma betulina (Buchu) is one of South Africa's best known medicinal plants and has been used by the indigenous peoples of the area for centuries to treat a wide range of ailments. It is an effective diuretic and anti-inflammatory. Early Dutch settlers used buchu to make a brandy tincture and Boegoebrandewyn (buchu brandy) is still used today to treat many disorders. Taraxacum officinale (Dandelion) is a rich source of vitamins and minerals, including Vitamin A, D, C, various B Vitamins, iron, lecithin, silicon, potassium, magnesium, zinc and manganese. It enhances liver and gall bladder functioning and may decrease high blood pressure due to its diuretic properties. Olea europea is well known for its ability to lower blood pressure, improve circulatory functioning and balance blood sugar levels. Caution: Do not stop using your prescription medication without first consulting your doctor. Yes, of course! Using High-Rite and AquaRite, while following a healthy diet and lifestyle may completely normalize your blood pressure and remove the need for prescription drugs. If you have mild hypertension, or a family history of cardiac disorders, these remedies can also prevent problems in the future by acting as cardiac and circulatory tonics. Caution: Safety in pregnancy has not yet been established. Use only under medical supervision if you are also using prescription medication for hypertension. Because these herbs are very effective in controlling blood pressure levels, the dosage of your prescription drugs may need to be reduced or even stopped altogether. I don't know what I would have done without High-Rite to reduce my blood pressure, which runs in the family. I only wish that I had known about it sooner because it really works! I am only taking half the dose of my normal medicine after using your products for just 12 weeks. I hope that this will continue until I can stop altogether. My doctor has been very encouraging. I developed high blood pressure during my menopause. My doctor recommended that I use prescription drugs but this has never been my style. He wasn't very pleased when I said I was going to research natural alternatives, but has had to eat his words because all his dire predictions did not come true! After my recent check up, he could not believe that my blood pressure was normal again! I can recommend these products without reservation.